Home / Sopot Worlds Equipment Inspection. - Important news. Sopot Worlds Equipment Inspection. - Important news. Following another successful Worlds at Sopot I felt it appropriate to do a summary of the equipment inspection undertaken there. Last year at Medemblik the class adopted post race inspection for the first time which proved very successful, well received by competitors and had no measurement protests. Unfortunately at Sopot it did not go as well. Due to days lost due to poor weather I only managed to inspect 30 boats. 7 boats were found to be outside the rules with 10 measurement protests lodged which to me was very disappointing. As a class this needs addressing by all areas concerned. 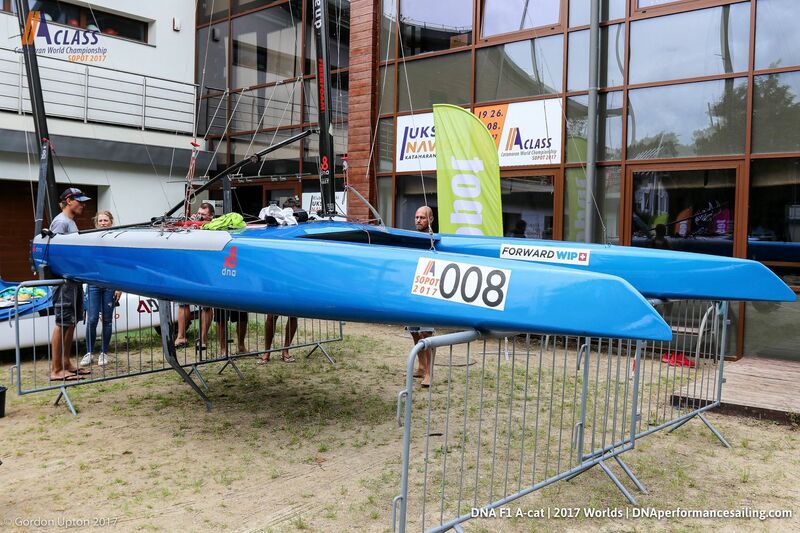 An email was sent to all competitors prior to the worlds outlining the requirements of post race inspection, explaining how the equipment inspections were to take place and outlining common issues I had found at previous regattas. All measurement protests lodged had been covered in my advice and reading this information may have well averted any issues. A declaration setting out the requirements of event sticker placement and separate areas explaining what was required with mast, sail, boat etc was distributed at registration for signing and initialling by each competitor. By simply reading this form before signing and initialing may have avoided many of the protestable incidents. Sails & masts having no measurer's certification. Measurement certificates in some cases presented at registration that did not belong to equipment used. It is the competitor's obligation to ensure his boat is class legal before entering an event (RRS 78.1). You may have a measurement certificate but you need to ensure that it is correct, fully completed and the necessary measurer declarations clearly evident on mast and sail. Many boats had replacement boards, rudders, retrofitted daggerboard cases etc. These changes require remeasurement and either a new certificate issued or the original certificate noted and signed by measurer with new measurements. Please ensure you use the latest measurement forms available from the IACA website. If something needs to be noted use the comments section or if not enough room, note and sign on the back of the form. Certification measurements as per sail and mast form must be permantley written on starboard side of mast and sail. Please use permanent markers for this that are clearly legible( red markers appear to fade very quickly). Note this certification is mandatory, not an option. If unsure of something refer to the Technical Committee, it is not your role to make rule interpretations. The Measurers Guidelines posted on the IACA website is a valuable source that is continually updated, please refer as it covers most issues. Sail measurement includes all the class measurement requirements but you are also responsible to ensure the RRS Appendix G requirements in regards class emblem, country codes and sail numbers are met. Do not measure a sail or issue a certificate if this cannot be done. Be aware of your conflict of interest requirements. If you need clarification on this matter please contact the Technical Committee. Whilst the onus is on the boat owner to have a rule compliant boat the obligation is on yourselves to ensure you are providing a equipment that fits the A Class rules. One of the main issues I encountered at Sopot was the 2.3m measurement exceeded for both daggerboards and rudders and in some cases this was not from retrofitted boats but boats from the factory. If competitors are needing to cut a portion of the daggerboard or rudder tips off to fit 2.3m then there is an issue in the construction and it needs to be addressed initially at your end. No constructor whether it be hulls, mast or sails has the authority to issue measurement certificates or have "deals" with measurers that the same certificate be copied and used for different items. The only exception to this is sailmakers who fit under the "World Sailing In House Certification Scheme"
It appears from discussions that a number of countries when conducting major events do not conduct any form of equipment inspection. This really needs to be addressed. The Worlds is not the place to find out you are not rule compliant. Your local measurers have one of the most thankless and time consuming jobs in the class and need your support and access to any form of training that may be available. The class has shown rapid development over the past years and for some it is difficult to keep up.